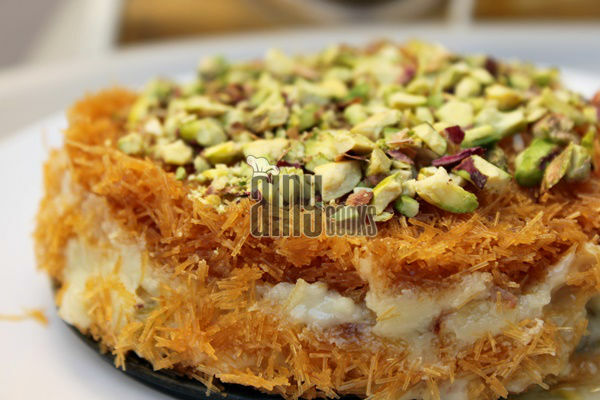 Kunafa , kunafe, Kanafeh, knafeh, kunafeh, kunafah is an Arabic dish like Umme Ali. Umme Ali was much appreciated dish by my readers. Today I am sharing a very delicious recipe with you, which is with Pakistani touch. 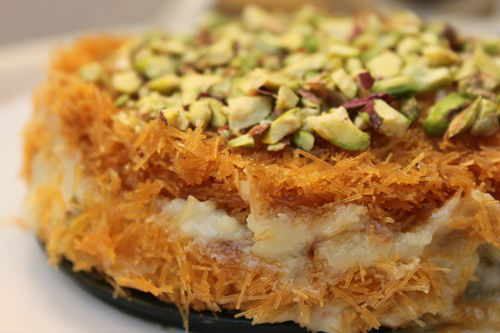 Kunafa is very famous in all middle eastern countries but basically its origin is Palestinian city of Nablus. 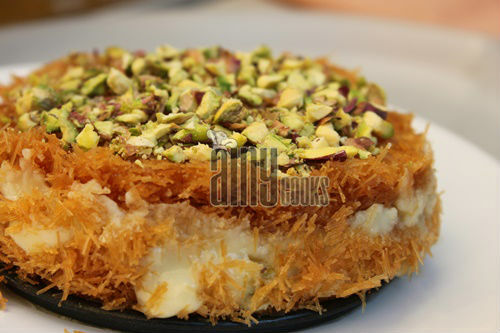 Kunafa dough or Kataifi is not available in Pakistan so I have used vermicelli, which is easily available here. You can give a layer of cheese and cream between two layers of vermicelli, but I have used a super delicious filling which I am sure you will love. In a pot add water , lemon juice and sugar, make syrup. Syrup should be thick in consistency. Crush vermicelli and add melted butter in it. In 2 cups water add milk powder, Corn starch, sugar. Cook for few minutes till become thick. Let it cool. In a blender add this mixture and cream cheese, condensed milk and cream. Blend till smooth paste form. You can mix with fork too. Take a loose bottom pan, grease with butter. Spread orange food color. Now spread vermicelli first layer, press it down with hand. Spread cheese sauce on layer , shredded mozzarella cheese and mixed nuts. Spread vermicelli second layer, press it down and bake it for 20 minutes at 180c. After baking spread syrup or invert it in a dish and remove from pan, pour syrup on top. You can spread condensed milk too. Serve hot. Garnish with nuts.